Ian Gavan/Getty Images for Austin ReedFormer model India Hicks abseils down the Austin Reed and Viyella Flagship store to mark the opening at 100 Regent Street on November 23, 2011 in London, England. 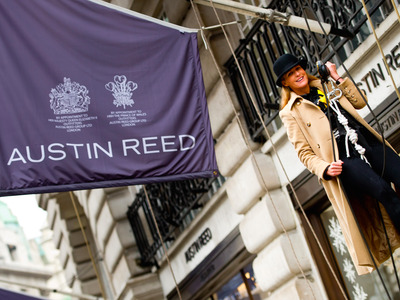 The owner of BHS was trying to buy struggling tailor Austin Reed just a month before the department store collapsed, according to new documents published as part of the Parliamentary inquiry into the collapse. It means Chappell was holding takeover talks just weeks before BHS collapsed. The department store went into administration in April, putting 11,000 jobs at risk. Retail Acquisitions Ltd is the vehicle that brought BHS for £1 last year from retail billionaire Sir Philip Green’s Arcadia Group. Retail Acquisitions Ltd is majority owned by Dominic Chappell, a twice bankrupt former racing driver who had no former retail experience prior to the BHS takeover. An early financing contract from Cornhill Capital suggested Chappell could even go on to takeover Arcadia, although Chappell has since denied this to MPs. Austin Reed was in financial difficulty at the time of Chappell’s interest and went into administration shortly after BHS.